For over 60 years, Conax Technologies has been a leading supplier of custom designed temperature sensors and compression seal fittings (sealing glands) for a wide variety of applications in every industry, from process control to aerospace. Conax Technologies is a fully integrated manufacturer with extensive in-house design and manufacturing capabilities, enabling them to provide superior products and services to their customers. Conax Technologies' fully integrated, modern facility features some of the most sophisticated manufacturing systems in the industry. Complete in-house capabilities include computer-aided engineering, design and manufacturing. They have state-of-the-art equipment for machining, assembly, welding and testing. All Conax Technologies' products are produced under stringent quality assurance programs. 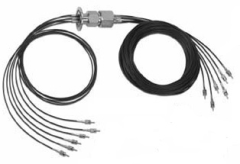 Conax Technologies has the in-house capability and expertise to custom engineer a temperature sensing or sealing solution to meet the exact requirements of your application. Their resources include an integrated product development facility dedicated to expanding sealing and sensing technology. Conax Technologies' experienced technical sales people, through a worldwide network of sales representatives, ensure that they can provide what you need, when you need it, no matter where you are located. Sensor and switching devices that are found in every industry, plus innovations, trends and upcoming events. Look for your first issue of the Sensors & Switches newsletter to arrive soon. Conax Pressure and Vacuum Sealing Assemblies.